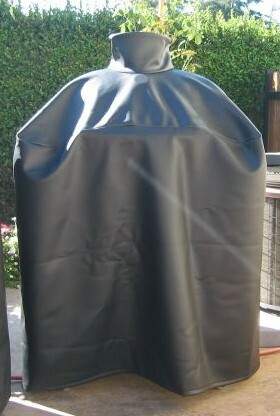 Keep your barbeque grill clean and looking like new when you use this grill cover designed by Primo for use with extra large oval shaped barbeque grills that are incorporated into a patio table. The heavy duty cover is designed to cover and protect your grill from moisture and other outside elements like ice, snow, dust, branches or leaves. This cover is specifically designed to cover ceramic barbeque grills that are situated inside a table. WARNING: Burning charcoal in this product can expose you to checmicals including carbon monoxide which is know by the State of California to cause birth defects or reproductive harm. For more information go to www.P65Warnings.ca.gov. I need a cover for a primo large oval grill in a cart (#368) with the side tables (#311). Which cover will fit this application? The part number for the cover you will need is the Primo 417. I have a Primo that is built in to a countertop. I want to make sure that I am ordering a cover that does not fit over a Primo and a table. I just need one to fit over the top of a Primo that is set into a kitchen counter. This cover is for both the grill and the table. We do not offer one for the grill only.